Day 3 of my spontaneous music challenge was focused on living composers. If you're familiar with my blogging or my social media-ing at all, you know that I'm a big proponent of living composers. Here are a couple of my picks from that day of listening. 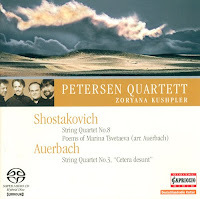 I started out my day with Lera Auerbach's Cetera desunt, "Sonnet for String Quartet No. 3." I really enjoy Auerbach's work in general, but the feminist part of me especially likes it because she's a quite successful young female composer. Not yet forty, she's been cranking out lovely work that teeters between tonality and atonality for years. Her work gets paired with Shostakovich often on records, and not without reason. There's some of that same forcefulness in her writing, some of that bow-breaking intensity, some of the endlessly building tension. The new music movement (or alt-classical or indie chamber, or whatever you want to call it) is a thing I really like, despite many of the pretensions assumed to surround it. In the end a lot of it is just good music. 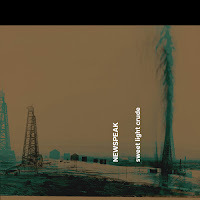 Newspeak is one of those prestigious New York new music ensembles that perform the compositions of all those hot young New York composers. They're under the direction of David T. Little, a percussionist and composer of my favorite work on this disc--the title track, sweet light crude. This piece wends its way through light and simple loveliness into angular modern beauty, then groove territory and frenetic chamber rock and minimalist breakdown in what I would call the B section, and back to a lovely, sad denouement. The composer notes that this is "about love and addiction; about misery; about the perversity of loving your captor. It’s a love song to oil." All the works here are worth a listen, but the title track really stood out to me as exceptionally composed and performed. To be entirely frank, I think a lot of the doom and gloom surrounding the classical music scene would dissipate if people would recognize living composers as what they are--the Bachs and Beethovens and Brahmses of today. Sure, it doesn't look exactly the same. But would you really want it to?